There’s nothing cuter than seeing a child playing, especially when it’s a young animal. Seeing puppies run around is cute, watching a kitten try and chase a bird is cuter, but seeing a baby elephant chase birds is the greatest sight of all! Elephants are arguably one of the most lovable creatures in the animal kingdom. We don’t need to tell you guys that, I’m sure you already know. 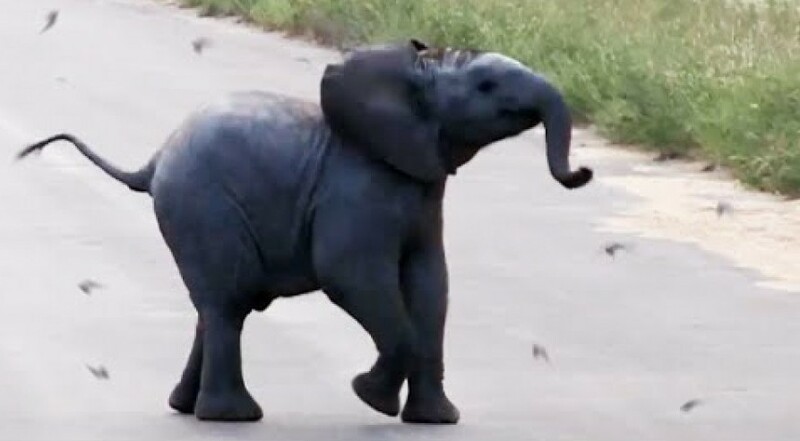 This video in question shows an adorable baby elephant chase birds away in a playful fashion. The low flying swallows seem to be the perfect distraction to this adorable elephant calf who seems to be having the time of their life! This encounter took place near Berg en Dal in the Kruger National Park in South Africa. I don’t know about you, but I really want a baby elephant now. These playful creatures really melt my heart and brighten up a day. Would you like to play with a baby elephant? Would you chase birds together? Share away people!